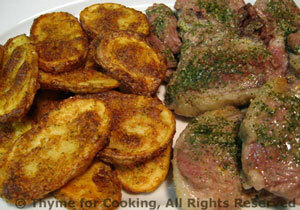 Baked Lamb Persillade, Thyme for Cooking easy gourmet dinners. The chickpeas call for Truffle Oil, and if you happen to have some, it's wonderful! But, it's just meant as a garnish so a good olive oil or walnut oil will work as well. Both Lamb and Potatoes are baked making this an easy dinner. You could substitute pork chops for the lamb, but will need to double the baking time (and then make a slit to check if done). This is a lovely, creamy soup. It gets quite thick after you stir in the cheese so I keep a bit of hot broth on hand to thin it to the right consistency. The fresh Parmesan adds a distinctive nutty taste. Cut cauliflower into small florets (leaving small 'stems'). Add celery and onion and sauté until tender, about 5 minutes. Add cauliflower, 1 1/2 cups of broth and thyme. 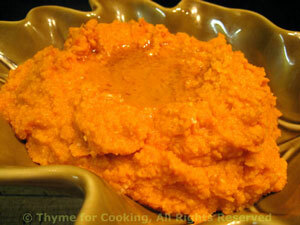 Bring to a boil, reduce heat and simmer until cauliflower is tender, 20 - 25 minutes. Return soup to heat, add milk or cream and bring to a simmer. Add more chicken broth if desired. Reduce heat and add cheese, whisking to combine. Do not let it boil or the cheese may separate. Add more hot broth if needed. 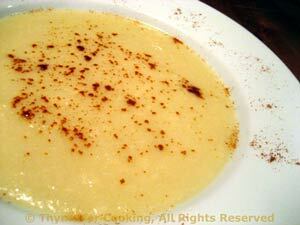 Ladle into soup plates, sprinkle fresh Parmesan, paprika evenly over the top and serve. Just a light coating of olive oil keeps these potatoes on the healthy side. 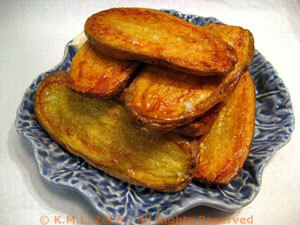 They are a lovely golden brown and crunchy. Sprinkle with a bit of sea salt for the perfect finish. Put olive oil on a small plate. Dip both sides of potato slices in oil, let excess drain back onto plate, and lay on a nonstick baking sheet (if you have one - just makes it easier). Remove pan, turn potato slices and return to oven for 10 more minutes. When done, remove from pan, sprinkle with salt and serve.